Comfortable and affordable Valletta accommodation are not as hard to find. All are located in various vintage areas of Valletta the capital city of Malta. The 4 and 3-star accommodation reviewed here deliver good, basic accommodation – sometimes with a few extra touches – to help you keep your travel budget in control. Your choice of Valletta does not commit you to sacrifice location. You are at the hear where transport has its central terminus from just 3 to 8 minutes walk away. Here you find our reviews of all the hotels in Valletta and Valletta hostels. It is a prime location for tourists. Valletta accommodation is varied and tourists have a comfortable selection if they wish a taste of everyday life. The location is even more convenient and central since all public transport coincides in Valletta terminus. So easy to go round anywhere you wish and there is so much to see. Valletta is a must to see. It’s riches with prestigeous architecture and treasures that you can read about and actually walk around and visit. As Malta in itself has a great historic background. Shopping will be even more easy. Bargains and souvenirs will be one door away from your accommodation whichever you choose. 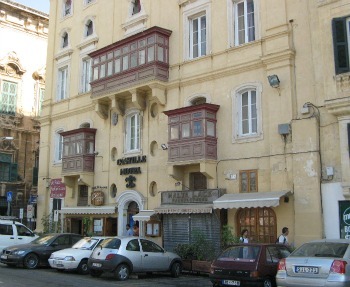 All the accommodation of Valletta is listed here. The hotel possessing panoramic views of the Grand Harbour located over the bastions. The centre of Valletta is reachable in a few minutes walk for any shopping you wish to do or admire the many beautiful works of art created mostly by the Knight of Malta. Each room has its own bathroom or shower en suite. A lift service is available to all seven floors and most bedrooms have a balcony from where you can enjoy the Grand Harbour view. Located within a 17th century building very close to St. John's Square, very close to all the amenities and historical monuments withing the city. Thew perfect place to be able to enjoy the everyday life of the old city. The apartments are nicely decorated to help you feel at home with a fully equipped kitchen and lounge with LCD TV complete with with separate lounges and bedrooms with an en suite bathroom. Free Wi-Fi is available. A free shuttle service is available from Luqa Airport to Palazzo Valletta on arrival arrival in Malta. Located at the heart of Valletta beside Auberge de Castille and the Upper Barakka gardens. A great place to stay giving the opportunity to mingle with the life of the capital city. Having 38 air conditioned rooms with basic features. There are two restaurants La Cave. De Robertis located on the roof with splendid views of Valletta and the Grand Harbour. A nice place where to stay with a family owned hotel. The longest established hotel in the capital city of Malta. Located in one of the terraced streets immersed within the life of Valletta. The best choice if the visitor wishes to enjoy the magnificent Valletta Grand Harbour with breathtaking views. Ideally located very close to St. John’s cathedral in the centre of Valletta, and the busy life around this area with numerous variety of shops. Just 5 minutes away from the main bus terminus with buses for all over Malta. Located in a palace built by the Knights of St. John. 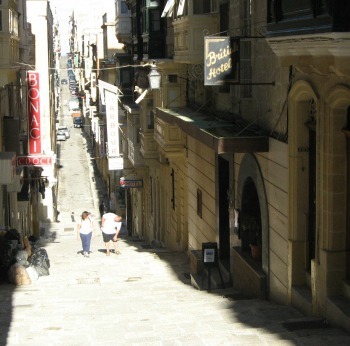 A few minutes walk to the main attraction within Valletta including restaurants and bars. Comprising of 63 hotel rooms all with en-suite bathroom including air conditioning, central heating and many other facilities. The deluxe rooms offer a sea view of the harbour. A roof top swimming pool area with magnificent harbour view. Valletta accommodation within the capital city a perfect combination to be at the centre of the island.